Deciduous if grown outside (Hardiness USDA 7) Evergreen indoors, eventual height to 45cm. This is a very attractive fern, hardy outside in the milder parts of the country but better as an indoor plant elsewhere. 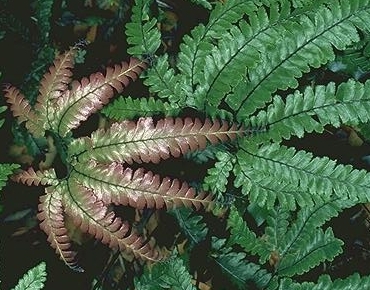 This is originally from eastern Australia, from Queensland to New South wales and is an easy fern to grow as long as it is not kept too warm/cold. Mature ferns have a lovely strong red colour in the new growth, maturing to green.Bronze Venus has particularly strongly coloured new growth. The picture shows a mature plant to give an idea how the new growth will look. If grown outside it likes a moist, rich, well drained and sheltered site. If kept in containers they must not be over-watered (same as other Adiantums), they do not mind the occasional drying out (but not too dry!). These ferns also respond well to a good feed once established. A lovely fern for mild gardens, containers or the cool greenhouse.